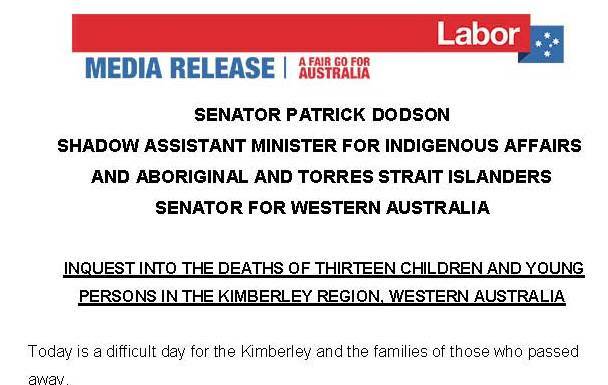 ” Today, Western Australian State Coroner, Ros Fogliani, released her report of the investigation into the suicide deaths of 13 Indigenous young people that occurred between November 2012 and March 2016 in the Kimberley Region. I cannot adequately express my sense of grief at the deaths of these young people. Nor can I ever comprehend the loss and devastation their families and their communities are feeling. The families and communities who have experienced these tragedies have been deeply affected and the pain will never leave them. The high rate of suicide among young First Australians is one of the nation’s most confronting challenges. Expand cultural programs including on-country trips, and develop or refurbish facilities for young people to meet and engage in activities. “ The report handed down today must not join the 42 reports into Aboriginal well-being delivered over the last 15 years that simply sit and gather dust. This report must lead a paradigm shift that leads to community-led solutions that address the clear sense of suffering, hopelessness and disillusionment that is being felt. We must continue to work towards building mabu ngarrungu, strong community, and mabu buru, strong country. Essential to this is mabu liyan – being well inside ourselves through strong connections to family, community and country. Government must understand us and our thinking around culture and well-being and not continue to simply impose its own views. A shift in the way major support services approach remote communities is needed to address the specific needs. I think we’ve got a lot of mainstream services trying to impose a particular model on the needs of the community. What we really need is to work with the community to understand what are the needs; and design the services to respond to the needs. Rob McPhee, Deputy CEO of the Kimberley Aboriginal Medical Services, said it was going to take years to tackle the complex issues that arose in the report, but action was needed. Indigenous Health Professor Pat Dudgeon at the University of Western Australia said she felt the report showed recognition to the issues that have contributed to Indigenous suicide. Our national Aboriginal and Torres Strait Islander suicide death rate is more than double the rate of the rest of Australian society. And among 15 to 34 year olds, it’s three times as high. The inquest has found common elements and factors contributing to the suicide deaths of the 13 young people. These include alcohol abuse, domestic violence, poor living conditions and poor school attendance. Tragically, these young people were never able to reach out for help from support services. There are 42 recommendations in Ms Fogliani’s report. These recommendations have been made to help target the causes of the issues. 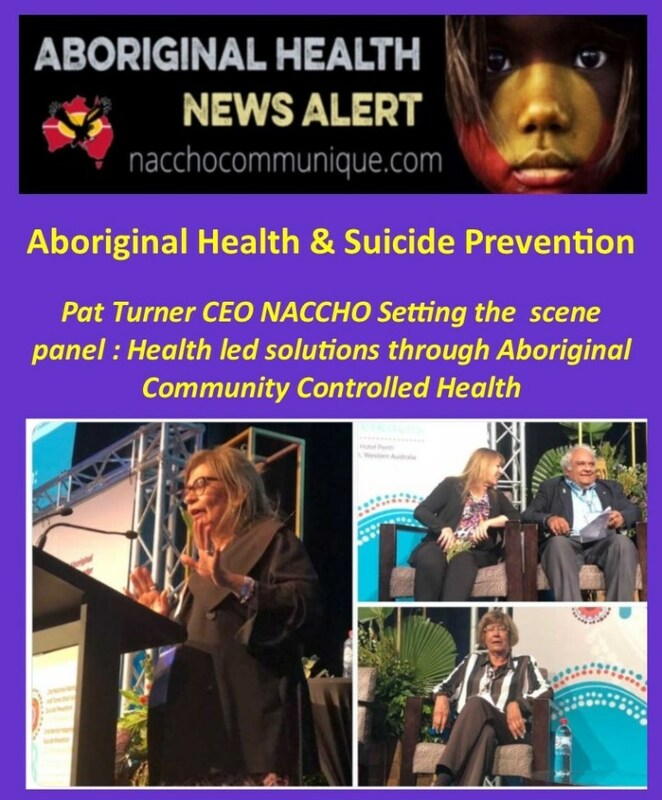 A number of recommendations highlighted the need for suicide programs to be culturally sensitive, and that genuine and empowered relationships with First Nations communities are critical for the success of any program. 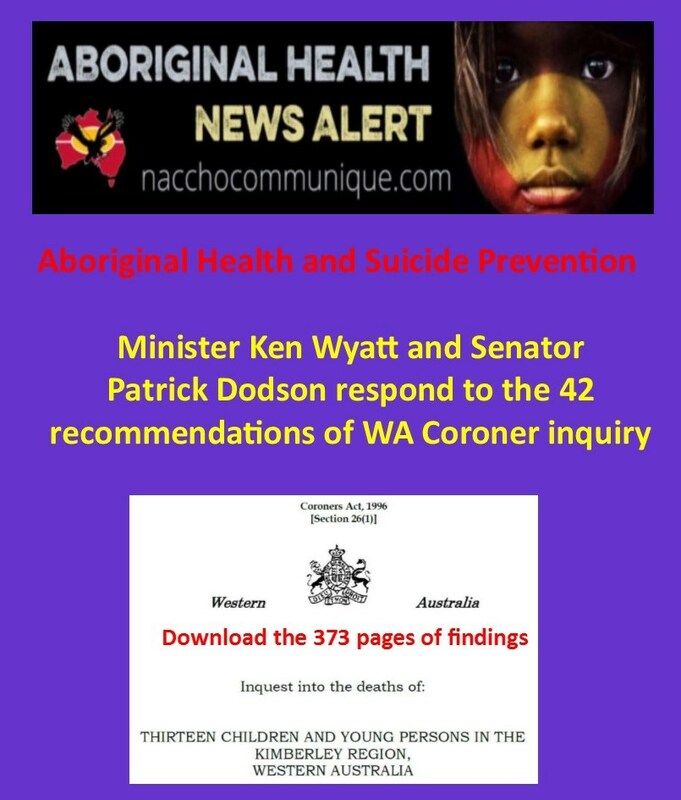 The report also highlights the need for better coordination between government agencies responsible for suicide prevention, and has recommended a Commissioner for Aboriginal Children and Young People be established. The Australian Government has taken prompt action to address youth suicide in Aboriginal and Torres Strait Islander communities. On 25 January 2019, I hosted an urgent meeting in Perth with experts and members from the communities to discuss how best to respond to these recent tragedies. supporting to families dealing with grief with a focus on suicide prevention. commitment to working with my WA state colleagues. 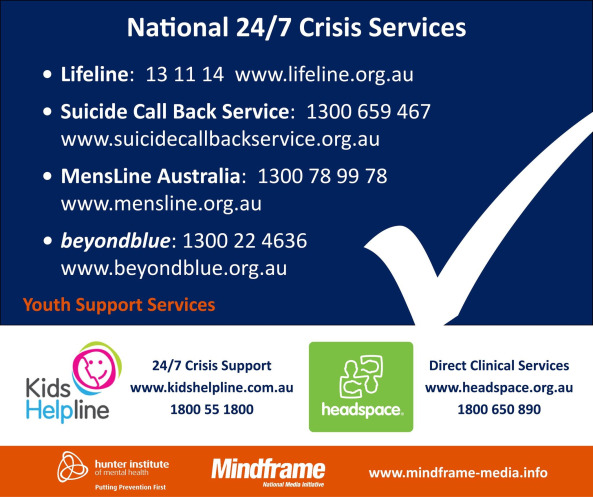 The Australian Government also provides $4 million to each of the 12 National Suicide Prevention Trial sites, including two sites for Aboriginal and Torres Strait Islander communities in the Kimberley and Darwin. The report provides a unique opportunity to rethink how we do things with local communities. I will be reviewing the coroner’s report as a matter of urgency. The Australian Government will carefully consider the WA Coroner’s report and recommendations. These will inform the Government’s approach towards the issue of Indigenous suicide in the Kimberley region going forward. Today, after nearly three years, State Coroner Ros Fogliani has delivered her findings in a significant inquiry into the deaths of 13 Aboriginal children and young persons in the Kimberley region between 2012 and 2016. The Coroner’s findings were handed down in Perth, and live-streamed to the Regional Courts of Broome, Kununurra, Fitzroy Crossing and Halls Creek. I sat in the Broome Court and it was crowded with a good cross-section of the community. This inquiry confirms what we already know – we have a crisis in the Kimberley. The rate of suicide in the Kimberley by Indigenous people, in particular young Indigenous people, is amongst the highest in the world. The Coroner reinforced the well-known social determinants of well-being which First Nations peoples live in. 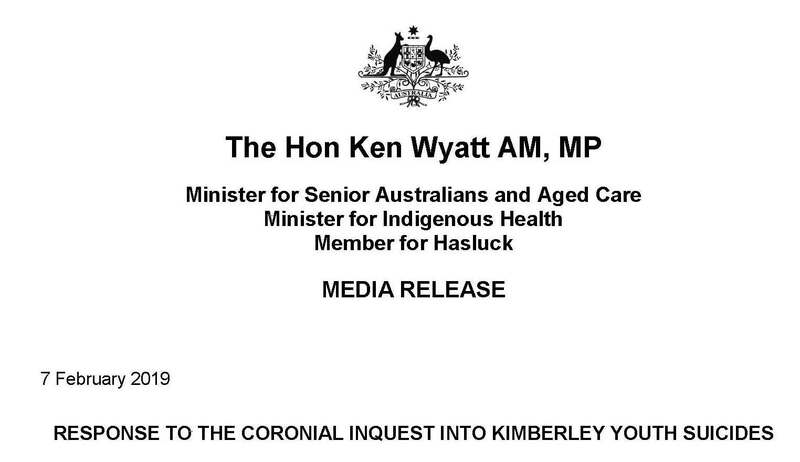 Ten years have passed since the last major inquiry into the deaths of young Indigenous people – the Hope Inquest. Today confirms yet again, we have made little or no progress. Clearly, the policies and service delivery that address suicide in our communities are failing and our people are losing hope. Too much seems to be reliant on being delivered from the outside and not from within our community or the Kimberley. The Coroner, in her final key recommendation, emphasised the principles of self-determination and empowerment in initiatives, policies and programs relating to First Nations peoples. She has relied on the expressed aspirations of the Western Australian Government. The Western Australian Government must now honour this with First Nations people. Any new approach must be informed by a rigorous analysis of the values driving the delivery of services. It must be holistic and therapeutic – addressing the complex needs of entrenched socio-economic disadvantage, unresolved trauma, cultural disruption, and systemic social exclusion and disempowerment. We need to prioritise programs that value cultural imperatives and programs controlled by Indigenous people.